Genue Perspectives: Solo Day Date in Denver - Genue Inc.Genue Inc.
Last month, I geared up to spend five glorious days skiing in the mountains of Colorado with my brother and cousins (you better believe I packed my heattech for the occasion!). However, as we arranged travel plans, I found myself coming to Denver a day early. With my brother working and my cousins flying in later that evening, I found myself with a whole day to myself in Denver. With a whole day to myself, I spent my day on a solo date in the city. Morning Coffee at Novo: As someone who can’t start their day without coffee, I’m happy to report Denver has no shortage of wonderful coffee shops. I started my day at Novo Coffee, and their coffee did not disappoint. The baristas were friendly and knowledgeable, and it served as an excellent start to my day. Got Lost in the Stacks at Tattered Cover: One of my favorite things to do in new cities is browsing local/independent bookstores, like Tattered Cover. I love to see local authors highlighted, and am a big fan of all the staff recommendations. I even stumbled across the debut novel my classmate at FSU wrote in the stacks—it was surreal! I didn’t end up purchasing anything because I always bring too many books on vacation, but I breezed through Jasmine Guillory’s new book, The Wedding Date, on the plane and I would highly recommend it! Matinee at the Mayan Theatre: Another guilty pleasure of mine is going to the movies solo. While eating out and seeing movies alone used to freak me out, as an introvert, I’ve learned to relish these alone times out in the world. With so many amazing movies nominated for Best Picture, and with all its rave reviews, I headed to the Mayan Theatre for an early showing of Call Me By Your Name (which definitely lived up to the hype—have you seen it? What do you think?) 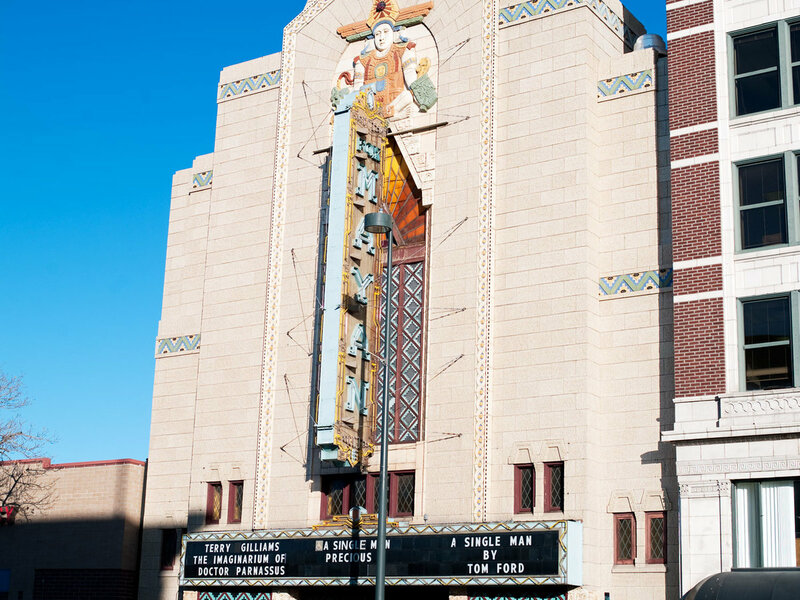 The Mayan Theatre is stunning—it’s one of the country’s three remaining theatres designed in the Art Deco Mayan Revival style and boasts an intimate and unique movie-viewing experience. If I hadn’t seen a 1pm movie, I would have definitely enjoyed a cocktail from the Mayan Bar during the movie—another added bonus of the theatre! Personal Pizza at Pizzeria Locale: Pizza is one of my favorite foods, especially Neapolitan style pizza. After visiting Boulder a few years ago and trying Pizzeria Locale, I was excited to see they also have a few Denver locations. After the movie, I ordered a Diavola pizza (sauce, smoked mozzarella, pepperoni, basil, chili flake), a glass of wine and finished my book. Afternoon Pick-Me-Up at Milkbox: Nothing satisfies my sweet tooth like ice cream, and I was delighted to find Milkbox Ice Creamery in the beautiful and well-curated Union Station in downtown Denver. As we waited for our cousins to arrive, I had two scoops–one of salted oreo and one of chocolate peanut butter cup ice cream. Next time I would definitely try one of their boozy milkshakes! Pre-Mountain Drinks at Euclid Hall: Before our drive to the mountains, we grabbed drinks and appetizers at Euclid Hall, just a few blocks from Union Station. We munched on French fries, fried chicken sandwiches and sipped local Colorado brews as we plotted our ski trip and various other upcoming activities. Service was prompt and the ambiance was cool and casual—just what we were looking for. Are you a fan of solo dates? Do you have any Denver recommendations I missed out on? We’d love to hear your thoughts in the comments!